Umpires, we have a dangerous injury epidemic on our hands—heads, masks and helmets. In 2012, I wrote about concussions, head injuries, and the mask vs. helmet debate: Plate umpires are in prone position to receive a thrown or fouled ball (or broken bat, for that matter), often to the upper body and head, making headgear of utmost importance in safety behind home plate. 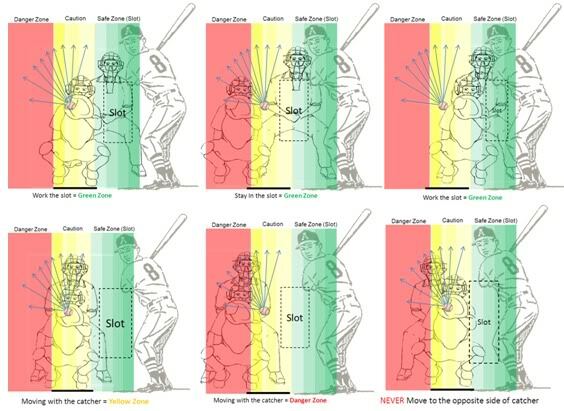 Plate Umpire Safety Zones and the Slot (Click to Enlarge). We know from years of experience and training that the slot position—that imaginary box between the batter and catcher, or inner edge of home plate if the catcher has moved outside—is the safest position from which to receive a pitch, or the so-called "Green Zone" of home plate umpiring. A number of the 2016 injures occurred when umpires vacated the safe (green) zone and entered caution (yellow) or danger (red) zones. For instance, yawetag diagrammed Chris Guccione's May 26 injury, noting that Guccione was positioned in the caution/yellow zone at the pivotal moment. 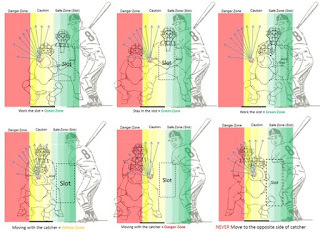 Positioning itself is pretty helpful in staving off many potential injuries (see the accompanying diagram for potential ball flight on deflection, and you'll notice the slot is clear from those most common trajectories), and always a great safety concept to review, but the remainder of this narrative shall be dedicated to the Mask vs Helmet debate. Traditional masks only protect the anterior head. To summarize, umpires by and large have two choices of protective headgear: a traditional-style facemask or a hockey-style mask and helmet (aka, "bucket"). 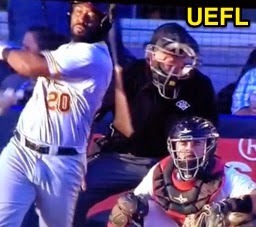 Most umpires continue to employ the traditional mask in their day-to-day, as the mask is lightweight, compact, easily mobile, and less sensorily restrictive. Others have opted for the hockey-style mask (HSM), which has been called a safer choice by several safety experts, including the National Operating Committee on Standards for Athletic Equipment (NOCSAE). 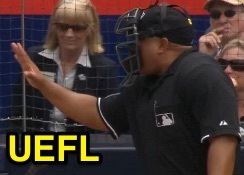 The traditional umpires' mask is a lightweight piece of equipment that fits over the top of a shortened bill of the cap and may be tightened so as to snugly fit around the umpire's face. The traditional mask came into use in the early 1900s and the general design has remained fairly constant ever since—the mask still encloses the umpire's face, but not the sides of the head. The hockey-style helmet or mask (HSM) is a more recent technological advancement, though...an umpire wearing an HSM stands out on a ballfield and not necessarily in a positive way. There is a certain stigma attached to defying tradition for new-age technology—look no further than the instant replay debate—and there are arguments to be made for both keeping and ditching the traditional face mask for the HSM. 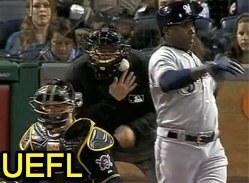 The most famous example of an umpire switching from the traditional mask to the HSM is Kerwin Danley, who was knocked out by a 96-mph pitch at Dodger Stadium in 2008, while wearing a traditional mask. When he returned to the game, he adopted the bulkier bucket. For many, the science is still out, USA Today finding that, "Not enough data is available to show if the hockey-style masks some umps wear are better than traditional masks." Ergo, the one distinct advantage of the HSM is its 360-degree enclosure around the head, and, thus, full-skull protection. An traditional mask-wearing umpire hit in the back, top, or side of the head by a deflected ball (off a fence or netting, for instance) may be significantly harmed due to the mask's exposure, whereas the HSM-wearing umpire hit by this same ball may escape uninjured. Similarly, umpires such as Jerry Layne and Brian O'Nora have been hit by bat barrels in the side of the head while wearing traditional masks, and exited games because of it. A bat is taken to the side of the head in Australia. Ump-Attire's Jim Kirk has even concluded that some of the newer HSMs offer a lower profile than ever before and, thus, "offers even better vision than most traditional style masks." Thus with the technological advances, the principal consideration for mask vs helmet appears to be style and comfort: There remains a noticeable weight difference in carrying a traditional mask in the left hand as opposed to carrying a bucket, yet the issue of vision appears to have been engineered moot. The question, thus, becomes whether the risk of a hit to anything but the front of the head is worth keeping tradition around. I personally became bucket-bound after one too many concussions, including an errant throw to the side of the head (the whiz of the ball as it's about to hit is such an ominous sound...), and have gotten so used to the full-head cocoon that the front-facing traditional mask feels deficient and exposed. Especially with smaller ballfields and closer backstops—not to mention those with fence cages so close to the plate area—it just made sense to protect the entirety of the head from the oft-freak deflection, turning a potentially catastrophic injury into a humorous baseball oddity.